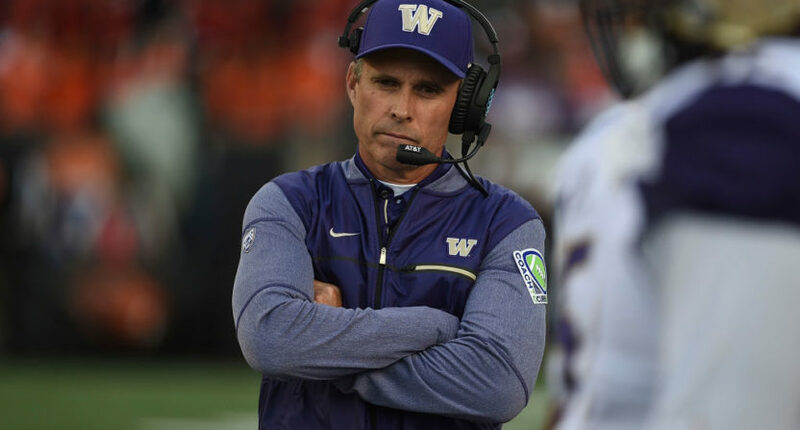 Chris Petersen has a point, but nothing's likely to change any time soon. Given our world’s basic governing properties of geography, time zones, and the need to maximize television ratings for football broadcasts, it maybe doesn’t seem out of the ordinary that the Washington keep playing in the late night, #Pac12AfterDark time slots. But Chris Petersen is tired of it already, and with good reason; games that kick off after 10 PM Eastern are much less likely to be seen in their entirety by an Eastern time zone viewing audience, especially those in the audience that have been watching games all day, from noon onward. An audience that might include, say, members of the College Football Playoff committee. Petersen voiced his displeasure with having to start games at 7:45 p.m. the next two weeks, starting Saturday at home against California. Because Fox Sports had the choice between the UW-Cal game and the Washington State-Oregon game, the network chose the Cougars and Ducks to fill the 5 p.m. time slot. That left ESPN grabbing the sixth-ranked Huskies returning home after back-to-back road victories over Colorado and Oregon State for their late broadcasting spot. This seems to be a common bellyaching over the years among Pac-12 coaches whose teams have played a string of night games. It hasn’t really happened much with the Huskies during Petersen’s tenure. In his first three seasons, the UW has kicked off at 4 p.m. or earlier in 20 of its 41 games. But so far this season, the Huskies have not had a kickoff time set earlier that 5 p.m.
“We want to play at 1 o’clock,” Petersen said. “It hurts us tremendously in terms of national exposure. No one wants to watch our game on the East Coast that late, and we all know it. This is a more than a fair point from Petersen! Though the Playoff has certainly helped expand opportunities for teams to get a shot at the national title (indeed, Washington was the #4 seed last year, losing to Alabama in a semifinal game), there’s still very much a human element involved. And while it’s nice to think that everyone whose opinion actual shapes the sport would go back and watch the late games they may have missed, that’s perhaps a naive expectation. Unfortunately for Washington, being at the mercy of television rights holders is not new for the sport, and it’s probably not going away any time soon.